Whereas the previous 1st Grade spelling words have focused on phonetic sounds and digraphs, the next few units will begin to cover vowel sounds. 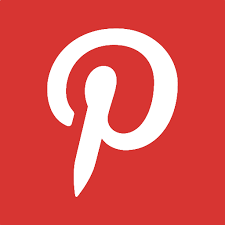 These tend to be a bit more difficult for students (at least they are for our children). Our oldest daughter struggled with all of the different vowel sounds and how they can change from long to short vowels. We've done a lot of work with her on vowels (plus, she has an awesome teacher) and she's come a long way since first learning how to spell most of these words. Here are a few worksheets I created to help her out. 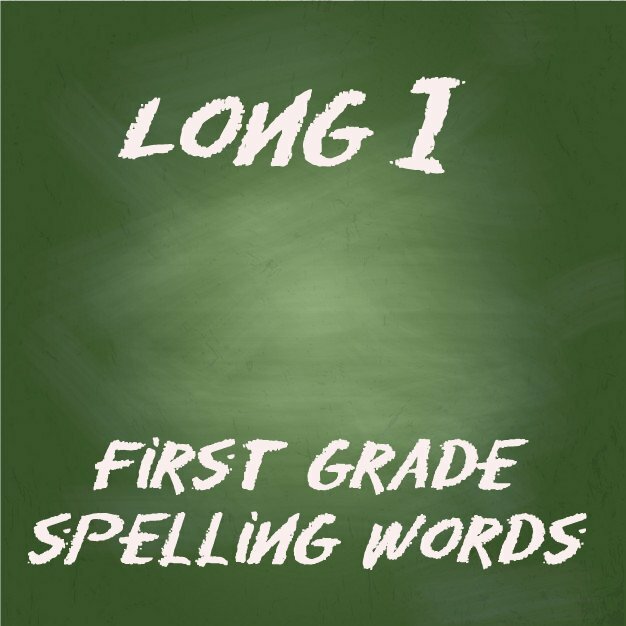 The spelling list and activities below will introduce the Long I vowel sound. 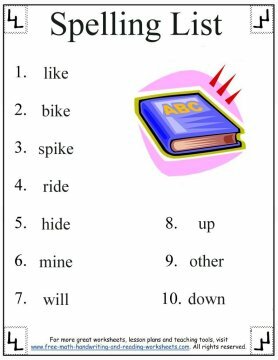 The first worksheet is the spelling list that you'll be using to cover this unit of spelling words. Print it out and use it to study with your child at home, in the car, whenever and wherever. Next is an alphabetical order activity. All of the spelling words from this lesson are in a list on the right. Using the lines on the left, write all of the words in ABC order. 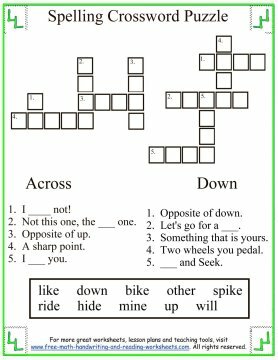 The third paper is a crossword puzzle using words from the list. Read the clues with your child and then write the correct spelling word in the boxes on the puzzle. 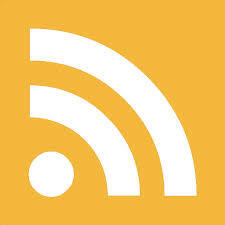 The next handout is a writing task. 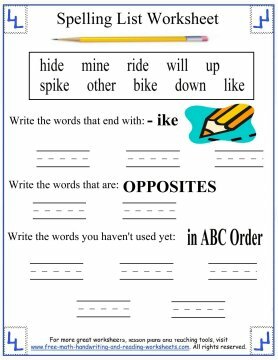 Follow the prompts to determine whic words to write on the lines. 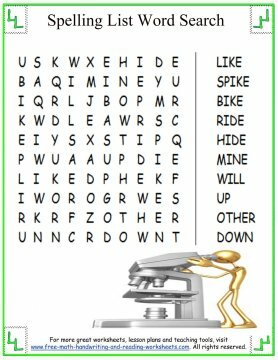 Then comes one of my favorite kinds of worksheet to make--the word search! All of the words from the spelling list are hiding somewhere on the paper. Find them all! The final paper is a writing and coloring activity. 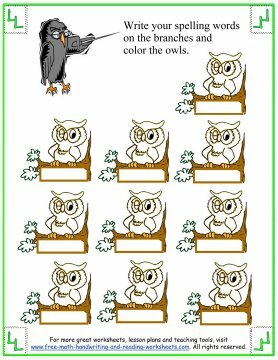 Write the spelling words below each owl and then color in the owls. I've mentioned this in previous lessons--you can make the worksheet a bit more fun by creating a color key for your child or students. 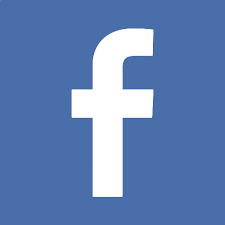 Have them color all of the words ending with -ike one color, the opposite words another, and the remaining words a third color. 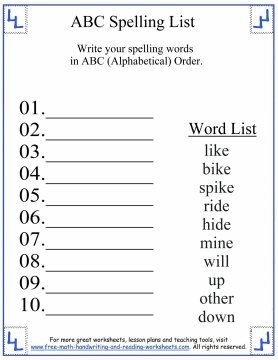 You can find more spelling lists and activities on the pages below. You can also search for spelling lists by grade level using the search box.